For many New Zealanders the anti-Israel UN Resolution 2334, co-sponsored by New Zealand on the Eve of Christmas 2016, came as a shock. It is one thing for a democratic nation to criticise another democratic nation for its policies. It is quite another to lead the charge on a resolution that was clearly seen, by Israel and many in New Zealand, as stabbing a friend in the back, acting contrary to those countries’ shared values, and nothing but counter-productive virtue-signalling. It was therefore an eye-opener to hear New Zealand’s Permanent Representative to the United Nations, Ambassador Gerard van Bohemen, reveal, in his 9 March 2017 address to the New Zealand Institute of International Affairs, how hard New Zealand pushed for the resolution and how the UN member states view such resolutions. The ambassador’s ‘view from within’ contained some surprising admissions. This fixation is what US ambassador to the UN, Nikki Haley, called a ‘prejudiced approach’. This ‘hardwiring’ in the form of routinely timetabled debates is an institutionalised bias against Israel. Despite all the ongoing conflicts and catastrophes in the world, no other country or issue gets this treatment. Anti-Israel bias has been called out on numerous occasions, including by former Secretaries General Kofi Anan and Ban Ki Moon and even Minister McCully, yet it seems to continue. This would explain why the resolution appeared to have been written in a vacuum, with no regard to the complex history of land now deemed to be “Occupied Palestinian Territory”, including prior UN resolutions, legal instruments and claims. Van Bohemen referred to a 2016 United Nations Quartet report as grounds for supporting the view that Israeli settlements were the obstacle to peace. However, that same report specifically mentioned Palestinian Authority incitement to violence and Palestinian Authority leaders’ lack of condemnation for terrorist attacks. It also distinguished between the different areas of the West Bank – these aspects of the report were completely ignored in resolution 2334. This is a striking admission; that a resolution that could provide the basis for boycotts and legal challenges against Israel was seen by the New Zealand delegation as a kind of discussion document – not to be taken at face value, but to get the parties to “talk about the ideas”. This might be the kind of touching philosophy that prevails in the rarefied world of the UN chamber, but such ideas are not connected to reality. It is unprincipled because it runs counter to past UN resolutions (not to mention promises by past US administrations) on which all peace-making efforts of the past 25 years have been based. It is unfair because it is unbalanced, blaming Israel for the failed peace process when it is the Palestinians who for years have refused to negotiate but turned instead to warfare and lawfare (this very resolution being a case in point). And it is counterproductive because it makes a negotiated peace much more difficult to achieve. 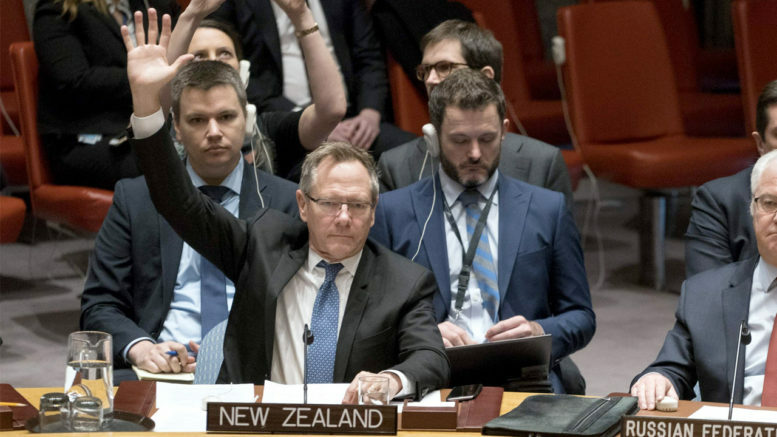 Despite the Government claiming otherwise, the stance that New Zealand has taken in sponsoring the resolution represents a new policy position and puts it out of step with its allies such as the U.K. and Australia, whose leaders have condemned resolution 2334. However, New Zealand’s Prime Minister has remained supportive of it while, after the fact, stating the desire to reinstate a ‘positive relationship’ with Israel, with no obvious action taken to do so. One can only make assumptions about the motivations of the New Zealand delegation to co-sponsor and vote for such a flawed resolution, but a plausible interpretation is that they did not fully understand or care about its implications. As our Ambassador himself admits, the New Zealand delegation and Minister of Foreign Affairs did not see the words or historical context as important. The key objective appears to have been to achieve a trophy resolution that can be stored “on the shelves” and admired by its proponents, even if it meant ignoring reality and New Zealand’s long-standing position, damaging relations with the only liberal democracy in the Middle East, and worst of all, undermining the peace process.